Midsummer is only rivaled by Christmas, but summer. It’s summer! 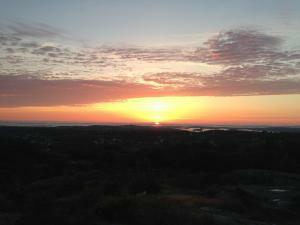 This is what midsummer looks like in Gothenburg. 10:15 pm approximately. 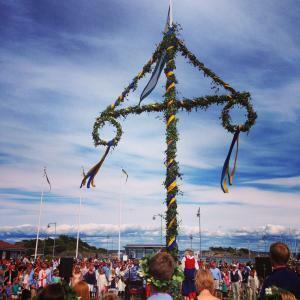 Midsummer in Sweden marks not primarily the middle of summer, but the longest day, midsummer solstice, this year taking place the day after solstice, always on a Friday. It’s really the beginning of summer, but even here in Gothenburg, this week and for another week or two, the sun doesn’t set until after 10 pm, and rises just after 4 am. Now imagine further up north. In a small town, I know well, Gávtjávvrie in Sápmi, way up north, but still short of the arctic circle, the sun sets for only one hour. Once you cross the arctic circle, the sun never sets during the weeks around midsummer. Our maypole here on the island. A big and traditional celebration. Long days, sunshine, and flowers are key ingredients in our midsummer celebrations, along with the season’s first potatoes, small, sweet, delicious, herring in sauce, a Swedish delicacy, and strawberries, also the season’s first. And I’m sure you know we consume those with copious amounts of beer and different types of vodka, flavored schnapps etc. Strawberries. 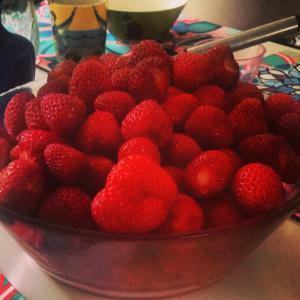 Nothing says midsummer like that first taste of strawberries of the season. There are many places to celebrate Midsummer in Sweden, and if you happen to be here in Gothenburg, I can recommend the celebration at our amusement park. Always lots of people, professional song, and a great maypole. But there are other places you can visit, all around our city. Check out this list from our tourist office. The weather? Midsummer usually means moving indoors and outdoors because often enough the weather will be typical for the summer: sunshine and rain, changing constantly. For now, the forecast (the most serious topic we discuss these days) seems okay. Trust me, I checked with four (sic!) weather sites. As I said, the weather forecast for midsummer is not to be taken lightly. Next PostNext As we wind down the sunniest summer, ever? Lessons to be learned?